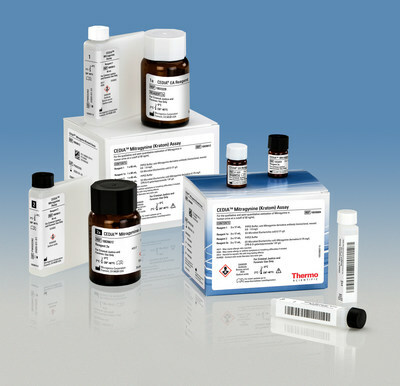 FREMONT, Calif., April 10, 2019 /PRNewswire/ -- Thermo Fisher Scientific, the world leader in serving science, today announced the availability of the Thermo Scientific CEDIA Mitragynine (Kratom) Assay, its newest drugs of abuse test that includes supporting calibrators and controls. The CEDIA Mitragynine (Kratom) Assay can be run on commonly used clinical chemistry analyzers, allowing a broad spectrum of laboratorians to test for the presence of Kratom. This test is for criminal justice and forensic use only.